Drummers (and other musicians), actors, artists, writers and creative people of all types have probably all thought about the idea of the “back-up plan” at one point or another. It is difficult to make money making art of any kind. It’s a winding path with no map and it can be overwhelming. Often, these creatives give up. When they do that, or when they are considering it, a frequent reason for doing so is money and stability. Making art is fun, but struggling financially can take all the joy out of it. It’s hard to focus on being creative when you’re concerned about whether or not you’ll have enough money to pay your rent. If you’ve ever experienced the stress of financial concerns, you understand how all-encompassing the worry can be. When I was a kid, maybe 12, I was faced with the decision about what high school to go to. It was a good problem to have. I had choices. I had been accepted into three great New York City specialized high schools. The High School for the Performing Arts, also known as the “Fame” high school, accepted me for drama. The High School of Art and Design accepted me for art. Finally, Stuyvesant High School, long known for its high level of academic rigor, accepted me as well. “Do you want to wait tables?” asked my mother. So, even at 12, the idea that creative aspirations are not achievable was planted in my head. I had to fight against that. And I did. I practiced drums and I played professionally. But I also went to school. I went to a top college and eventually I got an MBA. I’m glad I did. Because even though I didn’t really have a true back up plan that would eradicate my dream entirely, I prepared myself to be able to make money in other ways. That’s what I think is important. My advice is to put yourself in a position to be able to earn money in other ways if you want to. You might not want to ever give up on your artist endeavors. I know I don’t. But because I learned how to make money in other ways–by being entrepreneurial–I never have to stop. I’ve put myself in a position to be able to play drums for my entire life. If I want to go on the road, I can go on the road. I can run my business without being there. I can go practice for hours during the day if I want. So, yes, I considered alternate ways to make money. But not really in a “back-up plan” kind of way. A back-up plan usually plays out a bit differently. A back-up plan seems to imply that the initial plan will be to “go for it” and pursue the artistic dream vigorously to the exclusion of all else. But, then, if the artistic dream doesn’t work out sufficiently, the back-up plan will replace the dream at a certain time. There is an artificial deadline. For example, you might hear someone with a back-up plan saying something like this: “I really want to be a drummer, but if it doesn’t work out by the time I’m thirty, I’m going to go to law school.” To me, that’s a back-up plan. That seems like the usual method. It’s an “either/or” type of plan. 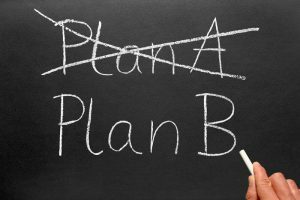 I also think that people with those plans usually wind up being lawyers or whatever the back-up plan fall back idea is. The arts don’t follow a schedule in that way. There is no true career path. You can’t predict when something is going to happen that will take your career up to a level where you can earn good money. Take for example, the story of Ann Dowd. She is a pretty well-known actress at this point. You’ve seen her in “Handmaiden’s Tale,” “The Americans,” “The Leftovers” and other movies and tv shows. Ann Dowd toiled for more than 30 years as an actress with very little recognition. But she stuck with it. She never gave up. Did she have to work other jobs that weren’t related to acting? Absolutely. But did she have a back-up plan? I don’t believe that she did. If she did, I don’t think she would lasted more than 30 years to get to the role that broke everything open for her. Read more about Ann Dowd HERE. What I’m proposing is that you are smart about this. Don’t box yourself in with a back-up plan that has an artificial deadline. But create other ways to make money. Going to music school as well as business school might seem like controversial advice but I actually think it’s a good idea. Become an entrepreneurial artist. You’ll have flexibility and money and you’ll be able to pursue your art forever.